a. not to be missed unless you're out of town for the weekend. c. worth skipping the Saturday morning sleep you could be getting. d. as intense--or not--as you want it to be. f. a celebration of sport on an important anniversary. I think Title IX is following me around this week. A few hours ago I was emailing athletes who benefited from Title IX and researching its impact on sports. Then I hopped in the car and drove five hours only to have Title IX reappear shortly after I sat down at my desk. My sister called and my multitasking phone call included me scrolling through Facebook and finding this almost-open invite. Hopefully Nike doesn't mind that I've borrowed their signage. You don't need to tell me twice to make myself available for some, or all, of this #MAKETHERULES Saturday. Waking up to yoga as the sun rises over Lake Michigan. Sweating and aching during a Nike Training Club workout that's anything but easy--I only watched a session after the Soldier Field 10 at the Nike tent and got even more tired than I already was (but I'm all for a challenging workout to whip my body into shape). Running three miles before most of Chicago has gotten out of bed and the path is at one of its most peaceful, least crowded times of the day. Scoring an opportunity to work out with Olympian Shawn Johnson, a gymnast on the 2008 team, and Cheeky Chicago. And all in the name of making the 40th anniversary of Title IX count. 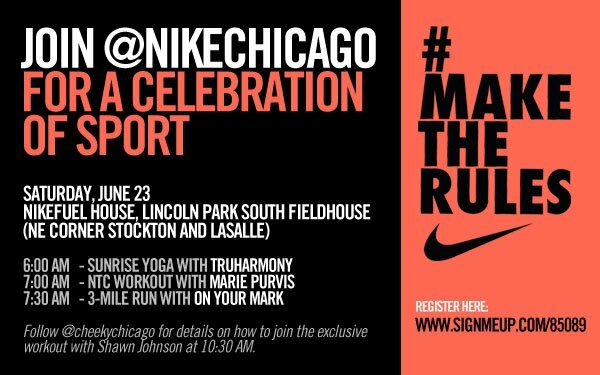 I was starting to wonder if Nike would be hosting a second round of the marathon preview it hosted near McCormick Place last June. It looks like I might have my answer--plus this is broader in scope being that it's about more than running. And the Saturday workout is practically a given. Are you curious enough about this Nike event to work it into your Saturday schedule? I think I am.